For teachers implementing an activity centers-based classroom, library, or makerspace, the KIBO Activity Center Guide provides 10 lessons that embed the KIBO philosophy of “Build – Art – Code – Play” in student-directed, discovery-based learning experiences. 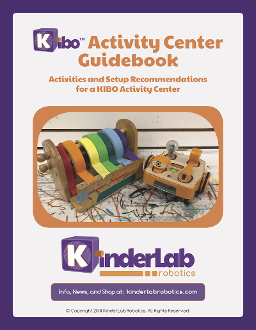 The guide provides suggestions for setup of a KIBO center including supplies and layout, general advice for facilitating activities, and 10 complete lesson plans. Each lesson plan provides specific setup suggestions, facilitation tips, and information on addressing cross-curricular connections and academic standards. The guidebook helps teachers maximize the use of one or two KIBO kits within a larger class, a makerspace, or a library.